Un grand couple romantique se retrouve ou pour une famille avec des enfants aussi. Les clients sont sûrs de profiter de vacances inoubliables dans ce chalet d'été des années 1920 entièrement rénové anciennement connu comme le Bradbury Cottage. Il est situé sur la rive ouest du Three MIle Pond. Le chalet est sur un terrain double relativement privé avec des bois d'un côté et le lac de l'autre. Three Mile Pond est bien connue pour sa grande population de bribes et sa grande pêche pour la grosse bouche. Spacieux salon / salle à manger avec porte coulissante en verre pour envelopper le pont avec une vue magnifique sur le lac. Les invités peuvent profiter d'un beau lever de soleil tout en se détendant pendant les heures du matin sur l'enveloppe du pont. La salle de séjour spacieuse dispose d'une cheminée en brique avec insert de poêle à bois. La cuisine entièrement équipée comprend de nouveaux appareils, y compris des micro-ondes. Chambre principale avec plafond voûté et lucarne. La chambre principale a deux futons à la fois dormant / canapé à temps plein pour un confort de sommeil / détente et peut facilement dormir quatre. Chambre d'amis accueillante avec lit superposé (complet et jumeau). Cottage a une salle de bain complète et un intérieur en pin noueux avec des planchers de pin jaune partout. Petit pont sur la façade du lac avec quai et flotteur. Situé sur l'eau avec deux kayaks et un canot pour des activités nautiques agréables. À la fin août, les clients peuvent profiter de la célèbre foire Windsor. Le chalet est situé près de Augusta, Waterville, Belfast et à environ 30 minutes de certaines des belles villes côtières du Maine, des phares et des plages. Il s'agit d'un chalet saisonnier et d'une «maison de pompage» qui fournit de l'eau au lac qui peut être utilisée pour se doucher, rincer les toilettes et faire de la vaisselle. L'eau embouteillée est nécessaire pour boire et cuisiner. Nous fournirons un gallon par jour de location qui est habituellement suffisant. Enjoyed the view and fall colors. Weather did not cooperate but we enjoyed playing games and the view of the lake. Quiet and peaceful slept so well. The cottage is clean and airy so being inside was not so bad. Sat on the deck in blankets. Fall Colors were spectacular. Did manage to canoe one afternoon around the island when the wind died and checked out all the old cabins on the lake. Sad we did not get to fly fish off the dock for the bass. We are so glad you enjoyed your stay despite the lack of cooperation from the weather! We also enjoy this time at the cottage. Congrats on your sorry game. I am queen of sorry in our house! You are welcome back anytime. Enjoy your year at Colby. We had such a great time at Julie and Michael's cottage. There is a lovely view of the water and the cottage itself is so well cared for. The master bedroom and the living room and are open and spacious. And there is a room with bunk beds that my kids adored. Everyone slept soundly and comfortably. We stayed here on the third weekend in September and it was nice cozy. And Julie and Michael were gracious and answered every question we had. We would highly recommend it. Thanks, Julie and Michael! Thank you so much for your review and it was so great meeting you at the Common Ground Fair- we are glad you found the cottage accommodating and please know that you are welcome back any time. This house on 3 Mile Pond is very nice and comfortable. View of the lake from the deck is beautiful. Used the kayaks to enjoy the lake. Location is great as it is close to many attractions, including the mid-coast. Will definitely return. Spacious both inside and out! We had a great stay and Julie was very quick to reply to all of our questions. We were fortunate to have good weather for all but one day and the lake and dock were great for both swimming and paddling the kayaks and canoe. The lake was surprisingly quiet at night (except for the loons!) even though there are a number of cottages. And there was plenty of space inside for four adults and a 4 year old during the one rainy day. The good collection of children's books and movies were a help too! I would absolutely rent Bradbury Cottage again! Thank you for your very thoughtful review. Since this is our first entire summer of renting our cottage it is very helpful to get feedback. Your family is certainly welcome back anytime. We are lucky that the owners rent it out and don't just instead live there! 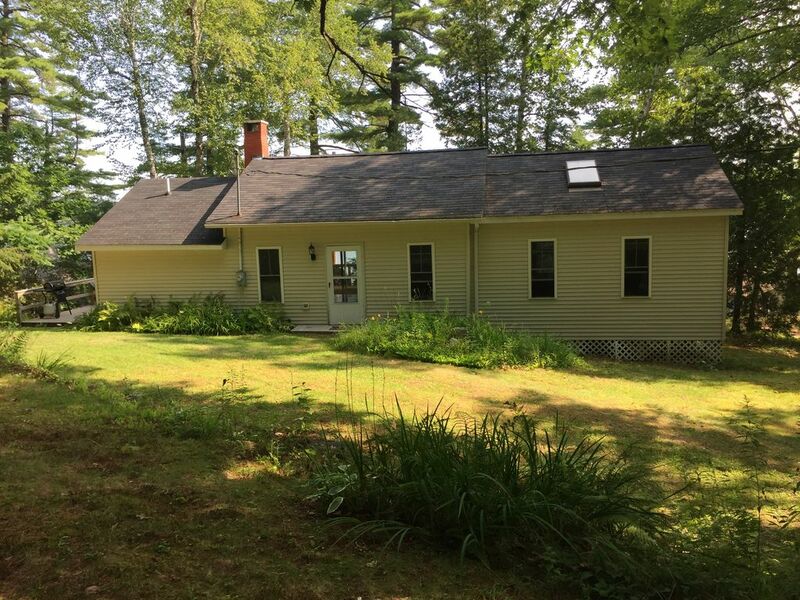 My family and I try to see family up in Vassalboro & Winslow every year, and earlier this year when we looked we were unable to find a cabin by the lake for our annual Memorial Day weekend getaway. After speaking with the owners of this property, we decided to wait an extra month and go at the end of June towards July. It was well worth the wait, being that this place is less of a cabin by the lake and more of a spacious lake home. Using the GPS to get there did not work on Google but instead worked with Waze (Waze is a subsidiary of Google.. Go figure). We used the canoe a few times and went out with my almost 3 year old son and he loved it (USCG approved lifevest for the little guy that we bought and there were multiple life jackets on site provided by the owners). As a city dweller, the only part about this place that we didn't enjoy was that there was no wifi present and 4gLTE service was spotty. It's okay though, we didn't die, and you won't either without the wifi. Come to think of it, it was nice being able to enjoy nature without the distractions. The owners are very responsive and respectful of privacy, and overall very gracious hosts. Don't forget to ask for the list of rules and precautions before you book to make sure you'll be able to abide by them. If you do book a stay there, you'll most certainly get your money's worth! Enjoy what Maine has to offer with a beautiful view! Thank you for the wonderful review. We are very glad that you had a great time and we would enjoy having you back. Our kids have been telling us for years to get WiFi but we really love not having it out there. Hope your trip home was pleasant. Fantastic cottage that is right on the water. Perfect for a quiet getaway. Amazing view of the water from their deck that corresponds perfectly with a glass of wine or a morning cup of coffee. The owners are super accommodating and promptly answer any questions. Absolutely planning on returning! Thank you for your very kind review. Please know that you are welcome back anytime.